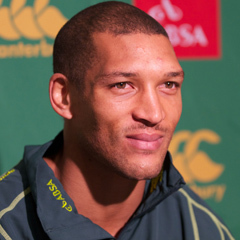 Cape Town - Springbok coach Heyneke Meyer has told fullback Gio Aplon not to be afraid to express himself in the third Test against England, as the Boks don't employ a conservative game plan. Aplon was on Wednesday included in the Bok No 15 position after Patrick Lambie failed to recover from an ankle injury. And Meyer says he picked Aplon precisely for what he's capable of - to create some magic. "Gio is a guy whom I've always rated. At the start of the series I wanted a more conservative fullback because there was uncertainty over the combinations and how the youngsters would fare. "I told him in my discussion with him that he's a very exciting player and that I've picked him for his strong points. He's the type of player that can create some magic. "There's no rankings order. If Gio can prove that he's the best fullback, he'll constantly play for the Boks," Meyer told Die Burger. The Springbok starting XV boast a combined total of 464 Test caps - 299 for the backs and 165 for the forwards.